Contributing editor Michael Leonard spoke recently with author Justin Cartwright about his latest novel, To Heaven by Water , and the mysterious institution of family, the inescapability of love, and the greatest human quality: empathy. Interviewer Michael Leonard: What was your inspiration for To Heaven by Water ? Justin Cartwright: My inspiration is always the same, the sense that life as human beings live it is endlessly fascinating, and that we are all striving if not to make sense of it, to fix ourselves in the universe. I see literature as one of the ways of achieving this and of moving our understanding on, if only incrementally. I see this tale as essentially a love story, particularly a brotherly love story between David and Guy Cross. Although they’ve traveled different paths in life, they ultimately come together deep in the in the Kalahari Desert in southern Africa. What brings them together, especially after having spent so much of their lives apart? Well, the obvious reason is that David needs to get out of town fast. But also since the death of his wife and the end of his television news career, he is free to explore what some would think of as other-worldly or spiritual ideas. And nobody is more interested in these things than his brother. Freed of the constraints of his previous life, and perhaps his urban cynicism, he finds a great release in his brother’s slightly crazy company, and comes to see that his brother has been engaged on a doomed, but noble quest. At the same time he realizes – he is very susceptible after his troubles – the inescapability of love. It seems that contemporary UK is full of contradictions and rapid change, the old clashing with the new. Tony Blair is out and Gordon Brown is in. London is now a melting-pot of people and cultures. Can you describe this in terms of David and his friends’ observations of the world around them? London has changed enormously in the last 40 years, in terms of values, public behaviour, financial and political probity and the stresses and strains of multiculturalism. David and his friends feel as if the world they knew has receded. In fact I think all middle-aged and elderly people believe this at any one time. Why do you think David was reduced to tears when he saw the beautiful vision of Darcey Bussell? Why was his son Ed so concerned and then perhaps embarrassed at his father’s outburst? The family as a whole have a lively appreciation of the effects of art and culture. In David’s case he is willing, and even eager, to dump his prejudices, including his prejudice against ballet. As it happens I attended one of Darcey Bussell’s farewell performances, and against all the odds was profoundly moved. Writers are always on the lookout for the kind of experience they can recycle in a novel; Updike once said to me that the only excuse for reading is to steal. As to why Ed was concerned and embarrassed, he thought the tears were brought on by grief, and more importantly, it is true that all children expect their parents to behave with dignity. God forbid they should cry in public. Without his wife, Nancy, David feels more “uncertain and more free.” Can you speak about this statement in terms of David’s current actions and his state of mind? Long marriages tend to institutionalize the protagonists, so that they are, as David puts it, canalized. This is not necessarily a bad thing, but I think that most partners in a marriage at the very least, speculate about what might have been. So while David has lost the comforting routines of marriage, he is also exhilarated by the limitless prospects open to him. David spends a lot of time ruminating on the past, his recollections of life in 1966, his time in Rome with Richard Burton, and his affair with Jenni. Is David stuck in the past? Not to give too much away, but has the accident with Jenni affected his abilities to move through life? Yes, up to a point anyway he is a captive of his past. David believed that after the accident with Jenni when he was a very young man, that he was culpable and so decided to live without the ambition to transcend the constraints of daily life, which he believed was possible up until the moment of the accident. “The generational wheel turns very quickly.” How does this statement reflect David’s current relationship with his two children and his daughter-in-law, Rosalie? I think what I meant there was that children become parents themselves, and they acquire moral responsibility which comes as a surprise to their parents, who see them as needing protection and advice. At only twenty-six, Lucy seems to struggle with happiness. She feels wary and abandoned, and worries about being alone and isolated. Josh wasn’t the boyfriend she had hoped for. She turns to Ed for support. In what ways are these two siblings alike and contradictory? I think Lucy and Ed have a very deep understanding. But their mother’s death – and this is a theme of the book – has shaken them all and made them reconsider. Although quite a lot happens in the book, it all takes place in a relatively short space of time. Ed and Lucy need each other in the face of their problems. Also they share a fine sense of humour. Both Ed and particularly Lucy rush to judgment over their father’s bourgeoning acquaintance with buxom Sylvie, the new book club guru. What does this tell us about Ed and Lucy’s ambivalence towards their father’s new lease on life? I think, as I said above, that grown-up children want their parents to retain their dignity. The idea of David going off with a new woman is almost sacrilege to them, although they acknowledge that it is quite possible. In some way Nancy had protected Ed and Lucy “from the stink” - from the harshness of the real world. Do you think this attitude of Nancy’s has helped them or hindered them in their current circumstances? I think they may be a little over protected, but at the same time it is up to the reader to assess Nancy’s qualities posthumously. Clearly extreme kindness was one of them. You get the sense that Ed is just so restricted by Rosalie, who is in turn oppressed by their inability to have a child. There’s a manic edge and a hint of desperation to both of them. Why doesn't Rosalie notice her husband’s discontentedness? What do you think the accomplished Ed is missing in his life? I think both Ed and Rosalie are suffering stress as a result of their inability to have a child. But the question you ask is best answered by saying that the voices of the book, in other words the author’s choices of vehicle, are only the Cross family, David, Ed and Lucy. So maybe in a sense Ed’s view of Rosalie is not complete. Come to think of it, whose view of anybody else is? Do you think Rosalie is able to forgive Ed or at least feel understanding for him? Is she the least changed character in the story? Yes, but also I think Rosalie has a strong survival instinct. She has weighed the choices. You avoid easy solutions for the Cross family, yet I found it interesting that in moments of crisis (I was thinking of Josh’s histrionic threat of suicide in front of Lucy) the family do come together and support each other. There’s this the “sense that they are of one flesh with a shared understanding.” What does this tell us about this family? I think it is the core of the novel. Family is a mysterious institution, sometimes reviled as the hiding place of all evil, sometimes praised extravagantly as the building blocks of a nation and so on. But it seems to me that all families have high and often unrealistic expectations of family, yet they are constantly aware that the link is not merely genetic but almost spiritual. In the course of the novel we discover a series of extra-marital affairs. There is also the shocking incident in David’s past which links to the title. Shame and infidelity, hurt and betrayal are all huge forces in your story. Do you see these people as disloyal or fickle? What do their actions tell us about the human condition? I don’t see them as necessarily that depraved or unusual; the more I know about families the more I discover that they all have secrets and disasters and infidelities which in the conventional wisdom would apply only to a small minority. It seems to be part of the human condition – however tough for the victims – that human beings are constantly looking for escape, which they believe will be a form of transcendence. The later half of the novel deals with Guy spiritually and emotionally in his own world in the Kalahari with his paintings and the elephants. He’s somewhat disconnected from the outside world. Of all the characters, he seems the most uncomplicated but also the most courageous. But is he truly happy? Can you explain the dynamic behind his life choices? No, I don’t think Guy is happy. His life is dominated by his belief that there is a TOE out there, the Theory of Everything, which somehow will give access to a holistic world. Personally I am a great believer in the idea that there is no meaning, in the spiritual sense, in the world. But I also think that it is an inescapable fact of human life that we all live and act as if there is, and try to find this meaning in our own way, be that religion or alternative beliefs or even militant atheism. Guy has come to believe that the San Bushman possessed the key to a better life. To that quest he has sacrificed his own family. What does David get out of his months in Africa and his sojourn with Guy? David comes to see that he loves his brother, but also he come to terms with his own situation. Months of aimless traveling in the Kalahari have resolved various issues in his own mind, including his own mistakes and his dead wife’s infidelity. A religious person would describe it as absolution. At the novel’s end, does David have many regrets? Has he made peace with his past? Without giving anything away, what does David learn about himself? I think I have answered that above, but perhaps I should add that he has come to see that nothing but love of family really matters to him. Are Ed, Rosalie and Lucy any happier with the choices and decisions they’ve made? Well, you leave them in a state of happiness, but you must make up your own mind if anything is finally resolved. Your characters all crave “the human texture” and are part of its “rich tapestry.” Can you explain this statement in the light of the major themes of the novel? The greatest human quality is empathy. It seems to me that literature is based on empathy: the best characters are all, not too obviously, representative of human qualities. They don’t have to be lovable or even likeable, but they have to be demonstrably human, and it is the writer who creates them from nothing. In literature it would be Charlie Citrine in Bellow’s Humboldt’s Gift . History, literature, war and politics are woven throughout and deeply influence these people, but they also complement your debate on contemporary life. There’s a real sense of immediacy here. How difficult was to build these elements into a work of fiction? A writer friend of mine regards it as folly to set your books too closely in a period, but I think of myself as a realist and so I don’t want to write about some historical void or dystopia. As Updike said – again – his job was to look at the ordinary and by close observation make it extraordinary. You seem to have uncanny insight into how people tick. Your characters are always fully alive and so three-dimensional. Sometimes they rush to judgment, but they’re also highly educated, their conversations always provocative and full of loaded exchanges. Do your characters come from within you? On one level all characters come from within, as you only have your own sensibility to work with. But then you make a choice: do you choose archetypes – as movies tend to – or do you draw on experience and observation. There are other choices, but I think I observe and notice what is going on. I try to, anyway. Central London is like a snapshot and a colorful backdrop to the action. The City almost feels like an extra character. What especially appeals to you about London? And likewise, Africa as the setting for section with Guy? The short answer is that I know some parts of Africa and London well. Africa seems to be very fertile ground for the literary imagination. And London is clearly one of the most interesting cities in the world, with a very long literary pedigree. Your books are complex and honest, full of acerbic insights into the world and people. This novel especially abounds with your love of words and their power. Have you always had this desire to write? I always had a certain facility, and somehow I knew I would end up a writer. I did work in advertising and documentary movies for years as well. Was To Heaven by Water more difficult to write than your other works? What was the most challenging, and likewise most rewarding? The most challenging aspect was to make real a family which has lost its central figure. I also took on some of the family myths. But all novels are difficult if you have high aspirations – seldom reached - rather than just the desire to entertain. I enjoyed writing the Kalahari sections, although my own brother is threatening to sue. Which authors do you call upon for inspiration? Would you like to share with us some of the details about what is next on your agenda? If you’re at work on a new novel, could you tell us a bit about it? I have just started a state of the nation novel about the collapse of a small bank, but I am well aware that events are moving on. Also writing a screenplay drawn from my last novel, The Song Before it is Sung , for a possible television drama. Finally, what life lessons (if any) would you like your readers to take away from To Heaven by Water ? I would never specify any life lessons. A good novel opens possibilities to the individual reader; it becomes a joint property and as such the reader makes up his or her own mind. Justin Cartwright's novels include In Every Face I Meet , which was shortlisted for the Booker Prize; the acclaimed bestseller The Promise of Happiness ; White Lightning , which was shortlisted for the Whitbread Novel Award; and the 1999 Whitbread winner Leading the Cheers . His novel The Song Before It Is Sung won the prestigious London Jewish Council Award for Literature. He was born in South Africa and now lives in London. 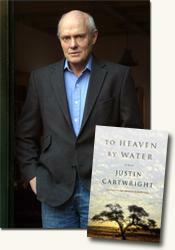 Contributor Michael Leonard interviewed author Justin Cartwright, author of To Heaven by Water (see accompanying review), about his book for curledup.com. Michael Leonard/2009.